H.E. 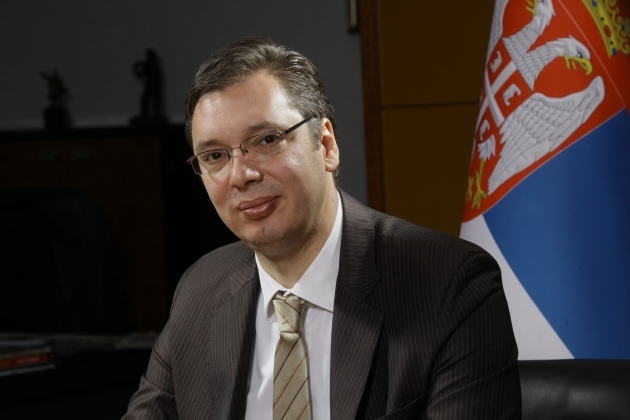 Aleksandar Vučić was born on 5 March 1970. He graduated from the Zemun high school in 1988 and from the Faculty of Law, University of Belgrade in 1994. He joined the Serbian Radical Party in 1993. He was elected an MP to the National Assembly of the Republic of Serbia in 1993. He was elected Secretary General of the Serbian Radical Party in 1994. He stayed in that position until 2008. He was appointed Minister of Information in the Government of National Unity in 1998. He was an MP in the Federal Assembly of Yugoslavia for three terms of office: the Council of the Republics as of February 1998, Council of the Republics as of May 2000, and in September 2000 he was elected an MP in federal elections. Together with Tomislav Nikolic, he founded the Serbian Progressive Party, and at the Founding Convention in October 2008, he was elected the party’s Vice President. After the general parliamentary elections, held in 2012, he was appointed Minister of Defense and the First Deputy Prime Minister, in charge of the fight against crime and corruption. At the Second Party Congress, held on 29 September 2012, he was unanimously elected President of the Serbian Progressive Party. He served as Defense Minister from 28 July 2012 until a government reshuffle on 2 September 2013. Since September 2013, he has maintained only the position of the First Deputy Prime Minister in charge of the fight against corruption and crime. After the Serbian Progressive Party won in the elections held on 16 March 2014, Vucic became Prime Minister. He held that position until August 2016, when, after the elections held on 24 April 2016, he began a new term as the Prime Minister of Serbia. After the victory in the Presidential elections on 2 April 2017, he was appointed for the President of the Republic of Serbia. He holds the Captain Misa Anastasijevic award for Person of the Year 2012, the Person of the Year 2013 award by Nezavisne Novine from Bosnia-Herzegovina. He has also received the Man of the Year 2013 award, given by the European magazine The Man, The European of the Year 2013 awarded by the First European House, the Vidovdan Award of 2013 from the City of Krusevac and the award Regional Leader of 2014 from Vecernji List, Bosnia-Herzegovina. He is fluent in English and Russian. He has a good command of French and is also learning German.